Do the two mix? Sure! Why not? But, if we’re being honest, I have to admit that it can be a challenge. Take this weekend, for instance: our girl Rio, a rescued dog of unknown pedigree (some kind of large-ish terrier cross), normally in excellent health, is suffering from a fairly severe bout of the stomach flu. So here’s were it gets, um, interesting: our apartment floor is covered with wall to wall carpet except for a tiny bit of tile in the kitchen and an even tinier bit of tile in the bathroom. Do you see where this is going? That’s right. Liquid poop. EVERYWHERE. Except on the tiled parts. Because those parts are easy to clean. You know what? I’m going to stop there because I kind of feel like I’ve already taken this story way too far. I guess it can be said that any carpeted dwelling in which a pet of any size lives, is going to see some “accidents”. It’s a part of life for pet owners. It just seems like a bigger problem when your space is tiny and your dog is big. Rio is around 50 lbs. Not a huge dog, but on the upper end of medium. She’s tall, long legged and skinny. That makes her seem bigger somehow. And she’s got a lot of energy and a big personality. She’s a large presence in our home. Her tail can clear the coffee table with one exuberant swish. In our nine-storey building, there are dogs in almost every apartment. Most of the apartments are as small as ours. Many of the dogs are larger than Rio, and are not the only dog in the apartment. Animal-lovers just find a way to make it work. Because the alternative would be to live without them. If a beloved pet is, or ever was, a part of your family, you understand what I’m talking about. And you know that living without them is just not an acceptable alternative. Rio is our kid. Our fur-child. We love her madly and can’t imagine life without our funny, bearded girl. In our tiny home, we have designated areas that are Rio’s. She’s got her food and water bowls in the kitchen. She’s not allowed on the furniture. Our bed is too high for her to get onto anyway. She has her own comfy bed in the bedroom nook area. During the day, while I’m working at my desk, she likes to nap on the floor beside me, and in the evening when my husband and I are hanging out in the living room area, Rio will curl up on the floor next to my feet while I sit on the sectional (she’s a mama’s girl!) When we have people over, she stays on her bed so she’s not bothering the guests or begging for food. She’s actually a very good dog! The best way to have a calm, well-behaved dog that doesn’t take over your small living space is to make sure they get enough excercise. Like the old saying goes: a tired dog is a well-behaved dog. Of course, there are times when Rio will gallop around the place like a crazed pony – usually when my husband plays with her and gets her all wound up. But other than that, our day to day life with a big dog in a tiny space is fairly harmonious. And then this weekend happened. In five years, this is only the second time she’s had a bout of uncontrollable -erm- messes. So, when you look at the big picture, it’s a small price to pay for the privilege of sharing our lives with this very sweet dog. Of course, the easy answer here would be to have a kennel that you can safely confine the dog in until the worst of the ailment is over. We used to have a fairly large wire kennel with a removable plastic tray at the bottom. We had this the first time Rio got sick, about two years ago. This was great because we could keep her confined to this easy to clean space. We realize now that our lives would have been much easier this weekend if we hadn’t gotten rid of the kennel. But here’s the thing: do you keep something that takes up that much space in your tiny apartment just for those few days every two years or so when your dog has the runs? If you decide against it, like we did, keep reading. Here’s what we do when small emergencies like this happen in our tiny apartment: We spot clean while it’s happening. (Folex is great for spot cleaning). We cover high traffic zones with plastic (duct taped down onto the carpet). We add absorbent towels to her sleeping area, and change them as needed. We monitor her every moment so that when she needs to go, we rush her out before things get out of control (we did this when she was confined to the kennel too, of course, but when there’s carpet at stake, you tend to be extra vigilant). There have been two sleepless nights so far. For the messes that happen at her front end, we’re lucky in that Rio will give ample warning when that’s about to happen, so we can get her to a tiled area to barf there instead of on the carpet. The thing is to just ride out the storm. Let the messes happen. Let the tiny apartment become a disgusting disaster zone. Just resign yourself to the mess and focus on caring for the ailing pet. You can clean it all up when it’s over. 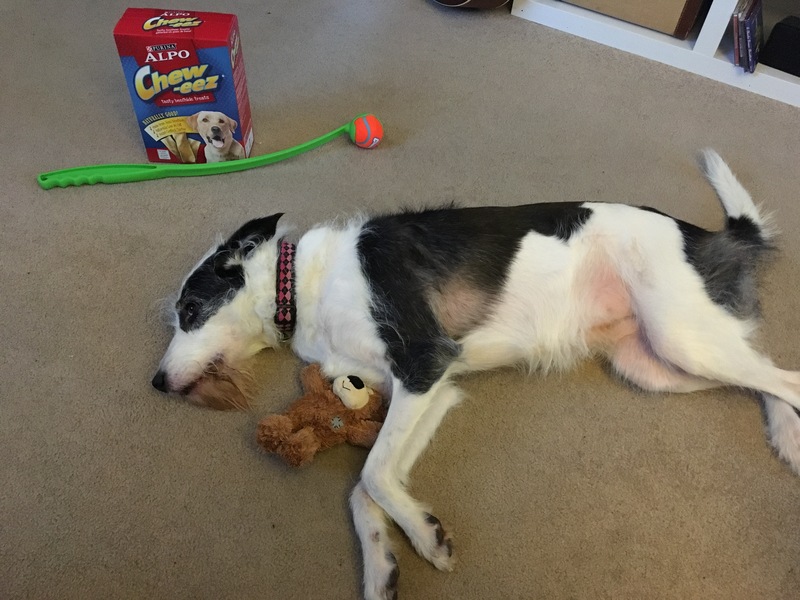 This is Rio, in a Christmas cookie coma, surrounded by her Christmas presents the morning after Santa came. 😉 Photo credit: tinyhomeinthecity. I’m happy to report that, as I finish writing this post, Rio is on the road to recovery – not eating yet, but feeling a lot better and resting comfortably. By tomorrow, she will probably be herself again, and my husband and I will head down the street to rent a professional-grade steam cleaner to thoroughly clean our carpet. Are you a pet owner living in a tiny home that’s experienced anything similar? If you have any additional suggestions or tips to make a situation like this easier to survive, I would be so grateful if you shared them in the comments below! I love your story! I don’t have a tiny home or a dog. I have a lizard. And a really big house. I lost him in my big house for 3 days. So it’s a little different. We were both rather traumatized none the less. Lol! Poor lizard! It’s the opposite problem: tiny pet, big house. No less traumatic for the parties involved!